Canada’s Log People — RandallAnthony Communications Inc. The maker of these log home kits, Canada’s Log People Inc., has built a successful export business by consistently creating high-quality products from B.C. timber. In fact, this emphasis on quality is critical for any company that exports large items, says Theo Wiering, owner and founder of Canada’s Log People, located in 100 Mile House in south-central B.C. Canada’s Log People certainly has staying power. Almost 40 years after it built and sold its first log house, the company continues to thrive in the upmarket niche it carved out for itself, selling about 40 log home kits a year. About a third of Canada’s Log People products go to buyers in B.C., Alberta and Saskatchewan. The rest leave the country, bound mostly for the U.S., with a few placed in 40-foot containers and shipped to Japan and Europe. A Canada’s Log People building kit ranges in price from about $20 to $40 a square foot. That means a 2,000-square-foot log house kit could have a price tag of $40,000 to $80,000 depending on the type of wood and complexity of the home design. Canada’s Log People started exporting in 1983, shortly after Wiering met an executive from a German company that built pre-fabricated homes. Fortunately for Canada’s Log People, Wiering was already actively building a broad client base in other export markets. Today about 50 per cent of the company’s foreign sales are in the U.S. Wiering says a key factor in the company’s success in America is due to its strong relationships with local dealers, many of whom have backgrounds in construction. Wiering says his distribution model varies from one country to another. In the U.S. and Scotland, he sells primarily through dealers. In Japan, he works with a resort owner and land developer. Canada’s Log People also sells directly to consumers, typically wealthy individuals looking to add to their collection of homes. 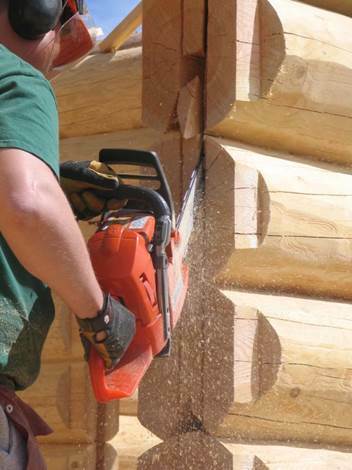 While building a log home is an old craft, todays’ structures are crafted to meet the latest regulatory standards for safety and energy efficiency. For Wiering, this means ensuring that he and his crew are always up-to-date on the latest rules. Currency fluctuations have also been a challenge for Canada’s Log People: when the dollar goes up, sales go down. But the business has also suffered during periods when the dollar was down, because a large portion of its accounts receivable is in U.S. dollars, says Wiering. To address the latter problem, Wiering has at times set up a forward contract with his bank to lock in the value of his U.S. dollar receivables. Today, Wiering is working to grow his export business, and would like to see it account for about 90 per cent of his revenue. To this end, Canada’s Log People has increased its advertising efforts, with a greater focus on construction companies.